Every living organism consumes nutrients and creates waste. To transform waste back to nutrients and complete this cycle, nature uses the processes of decompostition and evaporation. Sun-Mar toilets are designed not only to harness these natural processes, but to optimize and accelerate them. Toilet waste is over 90% water content. This can be evaporated and the small amount of remaining material is recycled into a useful fertilizing soil. Sun-Mar units are economical, quick to install and easy to use and because no chemicals nor septic systems are used, fragile environments can be protected. A Sun-Mar composting unit is an environmentally healthy choice for recycling human waste. The Sun-Mar system evaporates excess liquid and by continuously pulling air in it ensures no smell escapes from the unit. By using a Sun-Mar composting toilet you are doing your environment a huge favor. You are recycling the nutrients directly back to the plants they came from. The Centrex 3000 utilizes a continuous flow design for very heavy cottage or medium residential use. With a continuous flow system, rotation of the drum moves compost along the larger and longer 3000 series drum, before it drops automatically into the collection housing at the end of the unit. Under normal operating conditions the drum will not have to be turned backwards for emptying. All Centrex 3000 electric units feature a 370 watt 120 volt thermostatically controlled heater in a sealed compartment beneath the unit coupled with the standard Sun-Mar 30 watt turbo fan and 2" vent stack. This heater assists in evaporation of liquids, reducing the amount of effluent from the unit. The fan also removes any fresh odors from the unit, ensuring odor-free operation. This unit is for use with a Sealand low flush toilet. All Centrex 3000 series units are supplied with a 1" drain hose which should be connected to the 1" drain at the bottom left of the unit. This unit is for use with a Sealand low flush toilet. The Centrex 3000 AF (Air Flow) is a continuous compost flow design for very heavy cottage or medium residential use. With a continuous flow system, rotation of the drum moves compost along the larger and longer 3000 series drum, before it drops automatically into the collection housing at the end of the unit. Under normal operating conditions the drum will not have to be turned backwards for emptying. When used seasonally by up to 10 adults, compost will normally only need to be removed annually at the beginning of the following season. The Centrex 3000 AF features a 370 watt 120 volt thermostatically controlled heater in a sealed compartment beneath the unit coupled with the standard Sun-Mar 30 watt turbo fan and 2" vent stack. The Centrex 3000 AF is designed for use with a Sun-Mar Dry Toilet. A pipe piece, 45" in length and 10" in diameter, is supplied with the unit. The only restriction on installation is that the Dry Toilet needs to be directly above the unit so that there is a straight drop. This is long enough if the floor of the bathroom is up to 37.5" above the surface that the composter is placed on. 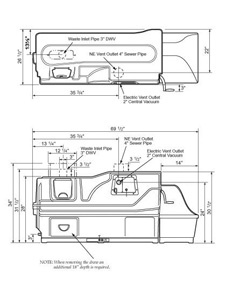 The pipe piece can be cut to size and additional pieces ordered if necessary. All 3000 series units are supplied with a 1" drain hose which should be connected to the 1" drain at the bottom left of the unit. This particular model should be able to evaporate all liquids as long as the heater is on, and it is not being used heavily, so an overflow drain may not be necessary. This unit is for use with a Dry Toilet. The Centrex 3000 AF (Air Flow) NE (Non-Electric) employs continuous flow design for very heavy cottage or medium residential use. With a continuous flow system, rotation of the drum moves compost along the larger and longer 3000 series drum, before it drops automatically into the collection housing at the end of the unit. Under normal operating conditions the drum will not have to be turned backwards for emptying. The Centrex 3000 AF NE features a 4" vent stack which is used to vent the unit passively. We also include a 12 volt 2.4 watt fan that is required in the vent stack to assist airflow. The Centrex 3000 AF NE is designed for use with a Sun-Mar Dry Toilet. A pipe piece, 45" in length and 10" in diameter, is supplied with the unit. The only restriction on installation is that the Dry Toilet needs to be directly above the unit so that there is a straight drop. This is long enough if the floor of the bathroom is up to 37.5" above the surface that the composter is placed on. The pipe piece can be cut to size and additional pieces ordered if necessary. 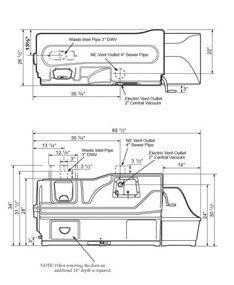 All 3000 series units are supplied with a 1" drain hose which should be connected to the 1" drain at the bottom left of the unit. Shipping Carton Dimensions (W by L by H) : 28" by 35" by 31 1/2"" 28" by 60 1/2" by 33" 28 1/2" by 60 1/2" by 36" 28" by 60 1/2" by 36"
Depth Required to Remove Drawer : 45 1/2" 45 1/2" 45 1/2" 45 1/2"
All units carry a full 5 year replacement warranty on the fiberglass tank and a comprehensive 3 year replacement warranty on all other parts.